Next Another day, another waste of of time and money? 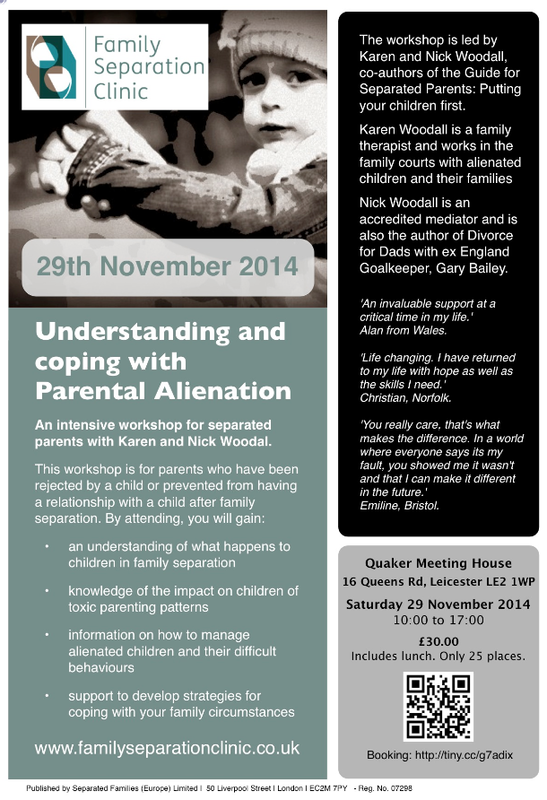 Having attended a workshop of this type by Karen and Nick, I highly, HIGHLY, recommend attending this. It will be ever so informative and useful that I just cannot recommend it enough! Please attend if you can. Hi Karen I cannot make this date, but I run a support group in the High Peak for separated parents and I am an alienated parent myself. I would love to attend this as I am a keen follower of your way of thinking 🙂 The support group I set up is called “Significant”. Its to remind parents that regardless of circumstances we are significant to our children. And there is always hope they will return. As a group we offer peer support and guidance, plus look at positive ways to strategically place ourselves in the best position to be the best parents we can (whatever is happening). And we want to influence social and political change in how alienated/non-residenct parents are viewed. We do this by inviting MP’s and Councillors and Local Authorities to sit with us and hear our voices. Rather than screaming for our rights lol :D.
Can you advise me when you will be running the next workshop? Good on you Elaine! Do you have a website or anything? It would be nice to see such emulated in my locality. Regards, M.
Elaine, I am in Stockport and am an alienated mum. I can’t find your group through Google. Can you provide details please? First of all, may I say I am NOT affiliated with Karen Woodall’s organisation in any way whatsoever. What I am is an alienated parent who has received tremendous help from Karen for which I am more than just indebted to her for and I write the following because I think it may help other alienated parents too. I have attended 2 workshops of this type. At this price they are a steal and believe me they are not being held for monetary gain. Can I just suggest to those attending to spend as much time as they can LISTENING to these 2 PROFESSIONALS and by all means do ask questions but just let them speak. In the 1st workshop a lot of people did keep discussing their own issue and Karen’s never-ending patience did not abandon her. I really do understand the anguish as I’ve been there – and still am. However, if you allow the explanations to come forth then you will understand why the alienated child, parent and alienator do what they do. In my case it has helped me gain same composure and compassion towards everyone, including me, and also the other parent. And the children too of course. In the 2nd workshop there was also one parent who kept on and on about their issue and this ate up valuable time. We all KNOW ABOUT CAFFCASS and SS incompetency. Don’t waste valuable time “slagging” them off coz it ain’t gonna make a difference. Also. Rather than spend time on your own issues, try to understand the patterns. If anything, that is what will give you the clues on how to best tackle your issues and hopefully pave a way back to your child. No offence intended to anyone but us alienated parents have a tendency to go on and on about our issues. Try to find another outlet but in this workshop, focus on Karen and Nick. Really. They’re the best. And it is actually YOU and YOUR CHILD that will gain.